Wake up temperatures in the upper 60s and lower 70s will head into the mid and upper 80s Monday afternoon in South Florida. Although record highs are not expected, highs will be about five degrees above average. The heat will persist for the rest of the week. 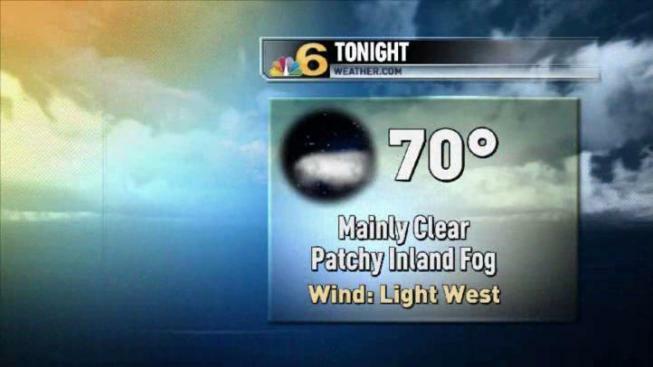 Some patchy fog will affect inland drivers Monday morning. Visibility reductions are most likely in far western suburbs of Broward and Miami-Dade and also in south Miami-Dade. Any fog that forms will lift around 8 a.m. Highs pressure will control South Florida’s weather Monday and Tuesday. It will be mostly sunny with scattered afternoon clouds. Shower chances will hover around 10 percent. Spotty afternoon thunderstorms are in the forecast mid and late week.